IRVINE, Calif. – Spectrum Group International, Inc., a consolidated global collectibles network and leading auctioneer of stamps, coins, arms, armor and militaria, and other memorabilia, today announced the launch of its latest auction venture, Spectrum Wine Auctions. 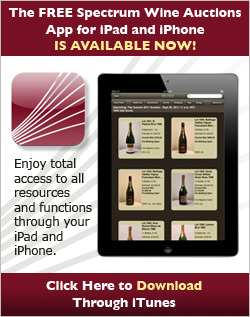 Spectrum Wine Auctions is the world’s newest live and online auction house of fine collectible wine. Backed by decades of auction expertise and driven by a team of dedicated wine specialists, Spectrum Wine Auctions is committed to offering buyers and sellers alike the most accessible and expansive auction opportunities for rare and vintage collectible wine. Spectrum Wine Auctions delivers a worldwide buying, selling and appraisal venue with live wine auctions in premier locations from Napa Valley to Hong Kong, as well as online wine auctions that span the globe, offering bidders and consignors alike the opportunity to collect and sell their favorite wines of the world with confidence and ease. Spectrum Wine Auctions is scheduled to host its first online auction in October of 2009, followed by the premiere live auction on Saturday, November 21, 2009. 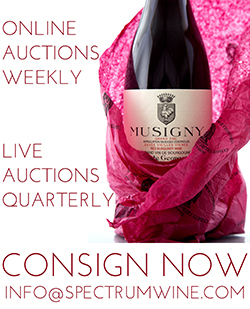 Complete auction schedule and details will be posted in the coming weeks on the company’s website at www.spectrumwine.com, and interested parties are invited to call 888.982.1982 for additional information and questions. The company is based in Irvine, Calif.
About Spectrum Group International, Inc. Spectrum Group International Inc. is a consolidated global collectibles network. The Company is a leading auctioneer of stamps, coins, arms, armor and militaria, and other memorabilia, targeting both collectors and dealers. Spectrum is also a merchant/dealer of certain collectibles and trader of precious metals. The Company's collectibles offerings span the modest to ultra high-end price spectrum. Spectrum conducts its operations in two business segments: collectibles and trading. Spectrum Group’s collectibles companies focused on philately are auction houses H.R. Harmer of Irvine, California; Corinphila Auktionen of Zurich, Switzerland; Heinrich Köhler Auktionshaus of Wiesbaden, Germany; and John Bull Stamp Auctions, Ltd of Hong Kong. Spectrum Group’s collectibles companies in the numismatics field include Bowers and Merena Auctions (rare coin and currency auction house), Ponterio & Associates (world and ancient coins and currency auction house), Teletrade (online coin auctions) and Spectrum Numismatics International (wholesale rare coin dealer), all based in Irvine, Calif. Spectrum Group also owns Greg Martin Auctions, which is engaged in the sale by auction of arms, armor and militaria.